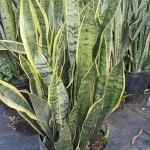 The Sansevieria, also called the Snake Plant and Mother-in-Law’s tongue, is a plant variety that is a great addition to any home, office, landscape or interiorscape. 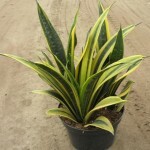 With nearly 70 varieties to choose from, including dwarf varieties and varieties that offer dramatic variations in their leaf colorations, the Sanseviera can add elements of style to and home, office, interiorscape or landscape. 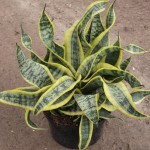 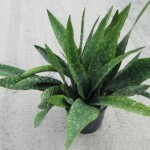 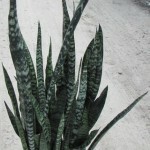 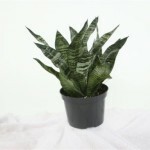 Sansevieria leaves are generally stiff, very thick and spearlike with a glossy texture, often mottled with white, and clustered flowers on slender stalks. 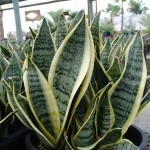 Sansevieria thrive on warmth and bright light, but will also tolerate shade. 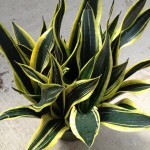 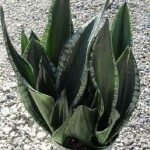 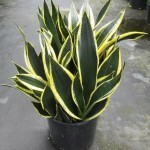 Therefore, the durability of Sansevieria makes it an excellent choice for low light conditions. 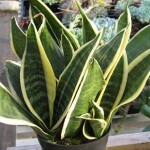 Sansevieria, however, will not tolerate over-watering, so it is important that if they are re-potted, it is in well-drained soil. 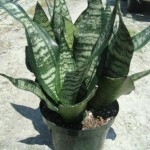 Pictured is the Sansevieria Moonshine.